Chesterton Indiana's eBay Drop-Off Store! At Auction Bay, we strive to give our customers great experiences buying & selling on eBay. This blog showcases top- selling items and gives informative articles. Honoring a Past Grand Master – this fraternal badge brought big bids! 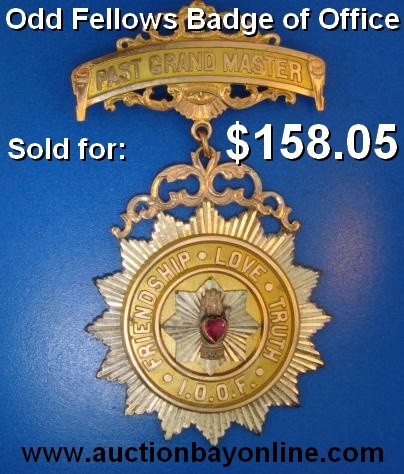 This Past Grand Master medal from the Independent Order of Odd Fellows brought a $158.05 sale! We’ve seen numerous and curious objects from fraternal organizations, and each of them has offered us the chance to learn a great deal about their organizations and the collectible nature of their objects. We’ve seen Masonic rings, Templar swords, and most recently, this medal: a badge of office from the Independent Order of Odd Fellows! This medal is a real beauty. In great condition for its age, this piece has all the most well-known symbols for the order, including the three-link chain, the all-seeing eye, and the starburst with the motto surrounding the palm is very distinctive as well. What’s more is that this piece of I.O.O.F. history bears the engraved dedication to its original owner on the back, dating it all the way back to 1933. It brought 14 bids from 7 different bidders, finally selling for $158.05 (which is, incidentally, three times more than the only similar medal on eBay in the past 90 days). If you have a piece of history like this or any collectible items from a fraternal organization, it could be worth a bundle. And when sold on eBay, many pieces like this one go into the hands of collectors, or to current members of the organization to be kept in a place of respect (or sometimes presented anew to a deserving individual). Don’t hesitate to bring your item in, and we’ll find out what it may be worth! Giving new meaning to “full service” real estate. Antique advertising wins again! This wooden cigar-selling Indian Chief sold nicely. Sell a Polaroid SX-90 and ring in the new year with Auction Bay! Add to your bank for this holiday season by selling with Auction Bay Online!